Before I made the switch over from Money to Quicken, I had heard a number of horror stories about people who had already gone through the process. Everything from computer crashes and forced reboots to complete file corruption and loss of data. You always have to take all of these with a grain of salt because obviously the people who are the most ticked off are also the ones most likely to post on a forum. The ones who make the switch without issue usually don’t show up on Amazon.com Reviews or the Intuit boards. I decided to take the plunge this year off, based off a great deal from Costco. I didn’t encounter any of the ridiculous errors that many other users claimed to have. But as I became more and more in tune with the software, I encountered a number of issues with the transition. These weren’t dealbreakers, as I was able to work around them. However, they do make me worried about the future of this product, considering that Intuit has a monopoly on this particular segment. It’s not your imagination – Quicken will randomly delete transactions from your history after you’ve made the conversion. I noticed after the switch that my credit card balances wouldn’t tie with the online amounts. The difference was small enough that I could tie it back to one or two transactions from my Money file. I couldn’t find any real reason why these 2-3 transactions didn’t make the jump over from Money to Quicken, other than the fact they were identical to other transactions, in terms of vendor and amount. For example, I bought the same sandwich from the same Subway on different dates and one of them was deleted. 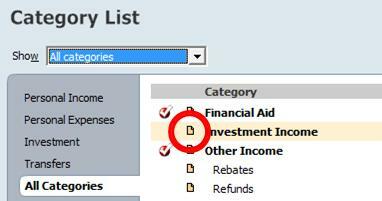 While small in materiality, for someone with a Finance / Accounting background, this type of error drives me nuts. The only way to fix this item is to do what I did: download your entire ledger from Microsoft Money and reconcile it with Quicken. This was a grinding task and that represented no more than $20 of missing expenses, but I guess I wouldn’t be blogging about personal finance if I didn’t secretly enjoy this. Now this one is weird. I began reviewing my expense reports after the conversion and I noticed that investment income was now listed as both a an income line item and an expense line item in my ledger. I dug deeper and found out that for some reason, Quicken had categorized a number of my expense entries as investment income for no particular reason. To add insult to injury, Quicken decided to make this error primarily on a bunch of my junk food purchases. (See the third pic below) Very funny Intuit. 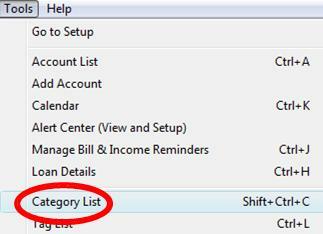 The easiest way to fix this problem is to use the Category List Tool that Quicken has. With all my complaining aside, this is definitely one of the features that I consider an improvement over Microsoft Money’s capabilities. To open the Category List, go to Tools and select Category List from the main menu bar. 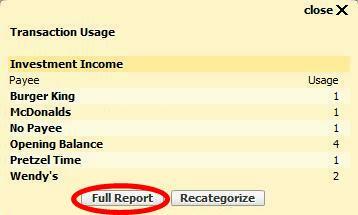 Then go to the Expense Category that you need to update by clicking on the small Report Button. Afterward, you should see a summary of all the expenses that fall into that category. 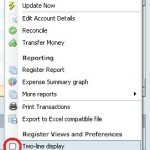 Click Full Report (not Recategorize) to pull up a journal entry ledger where you can manually update each incorrect transaction. When you create an investment account, there are two ways to treat the cash balance portion of your investment. You can setup a separate account that mimics a regular bank account or you can maintain a cash balance component within the investment account itself. Microsoft Money does the former while Quicken has a feature that enables the latter. 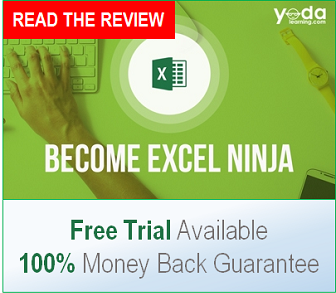 The problem during the conversion is that while Quicken maintains the Microsoft Money approach for all accounts you imported, it then uses the Quicken approach for any new account you create. 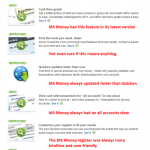 Quicken does not allow you to use the Microsoft Money approach on new accounts. 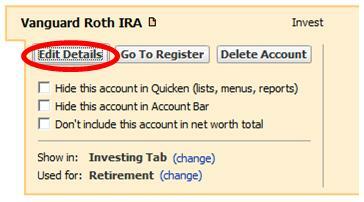 To convert your investment accounts to maintain it’s own cash balance, go to Tools and select Account List from the main menu bar. 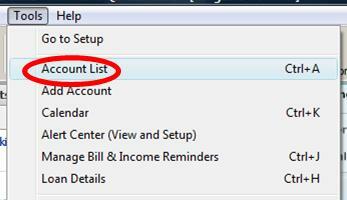 From the Account List, go to the old MS Money account in question and select Edit Details. 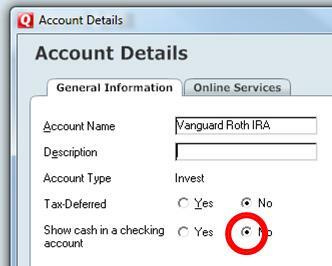 From this menu, move the radio button on “Show Cash in a Checking Account” from No to Yes.